If you have a task that needs to occur multiple times, whether for an offer, a preservation, or some type of property task, this can be accomplished by creating a recurring task. Recurring tasks occur repeatedly at set intervals that you define. When you create a recurring task, you will indicate when the first task should kick off, how many times subsequent tasks should occur, at what intervals they should happen, and how long the tasks should take. Recurring tasks can be set up as Auto Tasks that will kick off when certain activities in the Broker Brain system occur, or you can manually add a recurring task to a property. For information on creating a recurring Auto Task, click one of the following links: [Offer], [Preservation], or [Property]. For information on how to add a manual recurring task, see Adding a Manual Task. To disable a recurring task, place a zero in the "Trigger every __ days" field and click UPDATE. 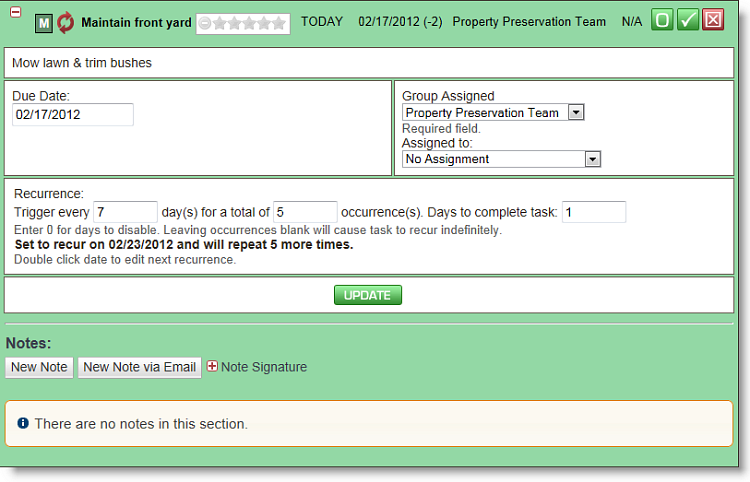 To disable all recurring tasks on a property, see Stopping Recurring Tasks. When you create a recurring task, you will be required to provide a due date. This date will trigger the first task. Whatever tasks recur after that will be determined by the information you provide in the Recurrence section of the task. To determine when to kick off the first recurrence, Broker Brain will first look at the due date of the initial task. In the sample below, we have created a recurrence with the initial task due on 2/17/12. Broker Brain will then calculate how many days after that the next task should be completed. Our task is set to recur every 7 days. One week after the 17th would be 2/24/12, which is the date the next recurrence should be completed. However, in the Days to complete task field, we indicated that our preservation team should be given 1 day to complete the task. In order for this to happen, the task will need to trigger 1 day before the due date. Thus, the recurring task will then kick off on 2/23/12. Note that this date is shown in bold letters below. In our sample, the task is set to recur for a total of 5 times, so this process will repeat itself 4 more times until the last task has been triggered.